The openingscene where the musician flees to West Berlin with the help of Kreutzman was filmed between Einsteinufer and the Marchstrasse. It is now the campus-area of the Technische Universitat of Berlin. 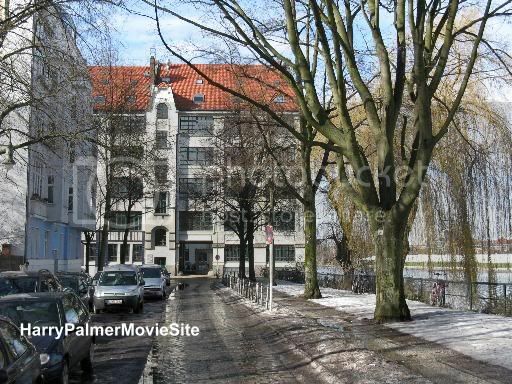 The white building in the back is the Heinrich Hertz Institut (Einsteinufer 25) and the building in front is the Werner von Siemens Bau (Einsteinufer 37). 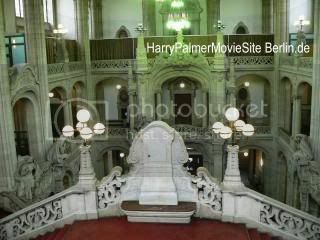 I think they also used this area for the final scene where Kreutzmann is shot by the Israeli secret service. There is nothing left of the old buildings surrounding this site, only the Campus Cafe. 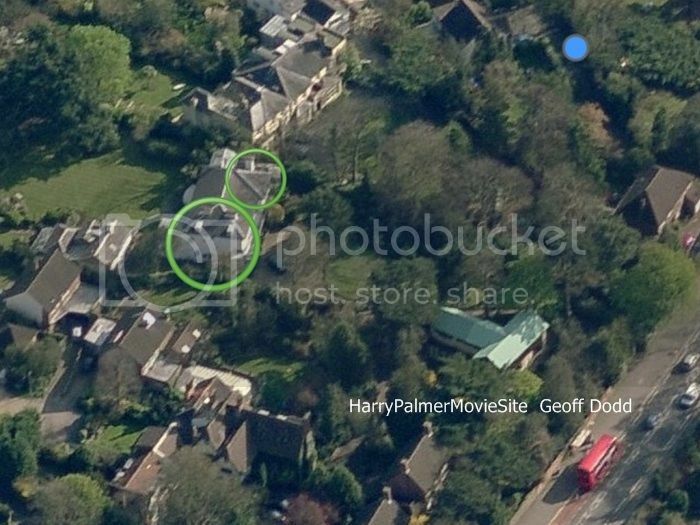 Harry has to go to the house of Ross to pick up information about his next assignment in Berlin, the house with its garden full of weed ("Yeah, it's easy to grow"). 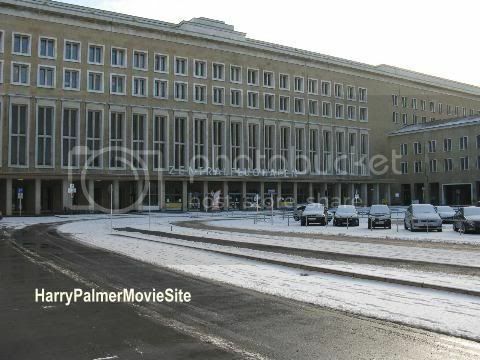 Harry arrives in Berlin on Berlin Tempelhof Airport. 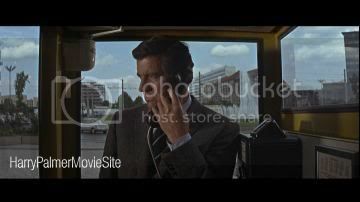 You can still recognize a lot of the movie on that airport. 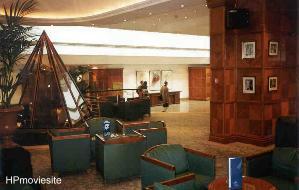 You can see the main hall where he arrives and where his baggage is checked . 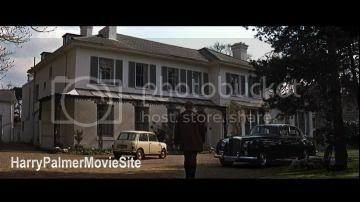 In the movie you can see the letters Restaurant in yellow light in the back of the hall. This restaurant sign is still there (see photo below right, under the clock). Customs were no longer working in this hall although there is still some equipment for handling the baggage. This hall is now closed due the close-down of the airport but can still be visited when you take the official tour. Vulkan's car was on the parking lot in front of the airport (see top right photo). The Israeli secret agent in the taxi is waiting there as well. Not a lot has changed there since the movie was filmed. When Palmer and Vulkan leave the building, you can see the words "Zentral Flughafen", these words are still there as you can see. 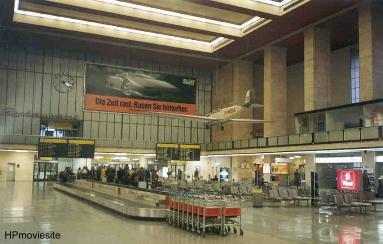 Despite numerous protests the airport was closed down on 30 October 2008. Its future is still uncertain. You can book guided tours (in German) here. 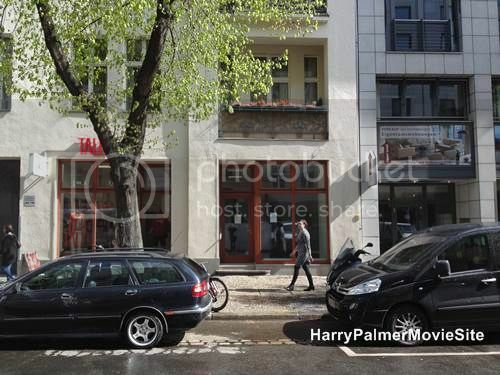 Johnny Vulkan's Clothes/lingerie shop (the cover of the British Secret Service in Berlin) where Harry is brought when he first arrives in Berlin, was located in the Fasanenstra�e 73 in Berlin. In the back of the shot you can see the Kempinski Bristol Hotel on the Kurfurstendamm. The shop was located opposite the Kathe Kollwitz Museum. 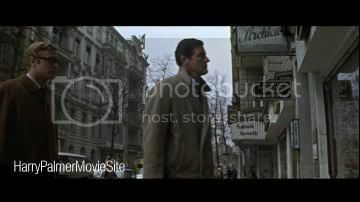 The entrance they used in the film is next to the Schauder & Jundef shop, now David Goldberg (updated 2012), as can be seen on the picture. 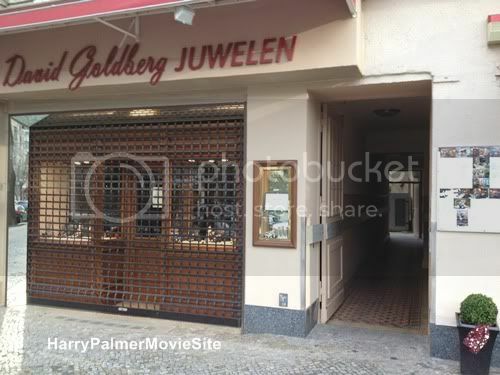 Update 2012: The Schauder & Jundef shop is now called David Goldberg, as you can see in the 2012 photo. Until the fall of the Berlin wall you had to cross the border of East and West Berlin at Checkpoint Charlie in the Friedrich Strasse. 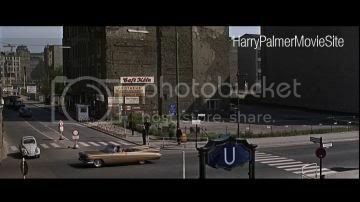 Harry has to cross the border here to meet with Colonel Stok. 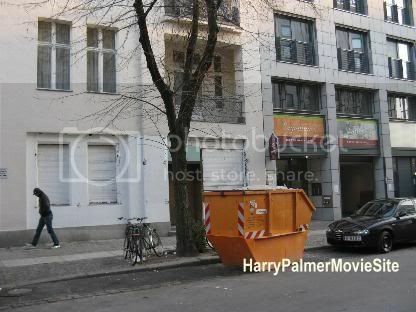 In a distant shot you see Harry walk towards this Checkpoint (now House at Checkpoint Charlie, a memorial museum about the Wall is located there). The Russians tried to stop the crew filming by mirroring the sunlight into the cameralenses. 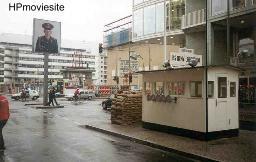 Checkpoint Charlie has almost dissappeared although they resurrected one of the old guardhouses. 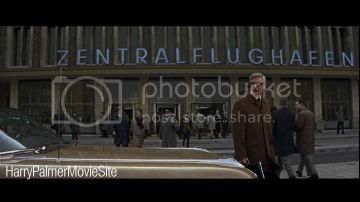 You can find Checkpoint Charlie on the Friedrichstra�e next to Kochstra�e. 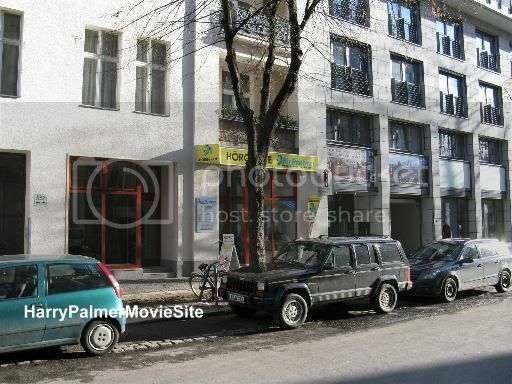 A difficult location to find in Berlin was "Marx Engels Platz 59", the meeting point for Harry and Kolonel Stok in East Berlin. Thanks to the great research of Peter Hegenbarth this location was found as well. The building where they meet isn't there anymore (an old railway station) but the church in the background is still there. "Allright, "Marx-Engels-Platz 59" really is the Spreewaldplatz. The building, the former G�rlitzer Bahnhof was ruined during the war and broken down between 1961 and 1967. 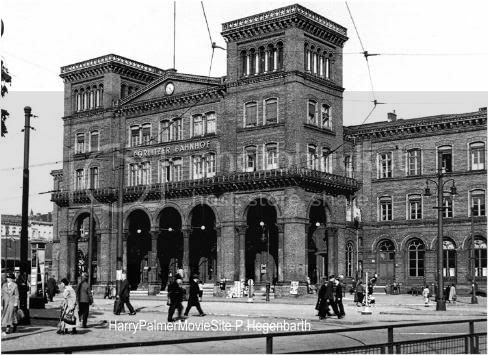 See also the photo above of the G�rlitzer Bahnhof in 1931. 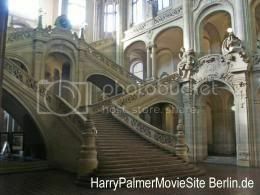 You can clearly recognise the archways Harry stands in front of. The area of the station was transformed into the G�rlitzer Park, which you can find on any Berlin street map. The whole site has changed. At the camera position there is now a public bath, the so-called "Spa�bad am Spreeplatz". My pictures were taken about 50 to 60 meters too close to the church and about 6 to 8 meters too high, as an artificial hill was erected in the park. The church is the Emmaus Kirche, www.emmaus.de, Lausitzer Platz 8, 10997 Berlin. 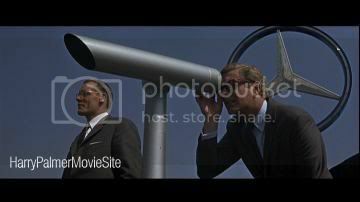 You can also identify the buildings in the background, which have survived with minor changes." 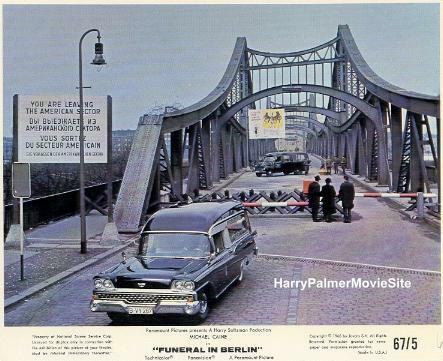 When Harry is arrested by the East German Police he is taken for a ride... 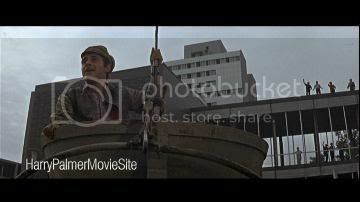 Most of this is filmed in the Kreuzberg quarter in Berlin. 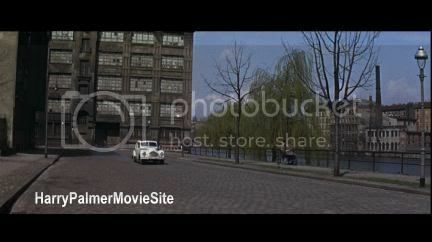 One of the shots along the bank of a river was filmed on the Gr�benufer, opposite the O2 centre, close to the famous Oberbaumbr�cke. You can still recognise the building in the back, it is cleaner and completely renovated. 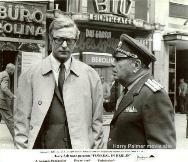 After Harry is arrested in East Berlin, he is brought to Colonel Stok's Headquarters. This building still exists and is located in the Lindenstrasse in the Kreuzberg quarter in Berlin as well. The former administration building of the Victoria- Versicherung can be found at the Lindenstra�e 19 – 25, 10969 Berlin (Kreuzberg). Build between 1906 and 1913 by Wilhelm Walther. In the background you see the resurrection of the former Kammergericht, which became the (West) Berlin-Museum and is now part of the Jewish museum. The street ended at Mehringplatz, but had been relocated in the meantime. The house hasn't changed much, obviously except for the trees. But even the dirty patches on a lot of the stones are still the same pattern. 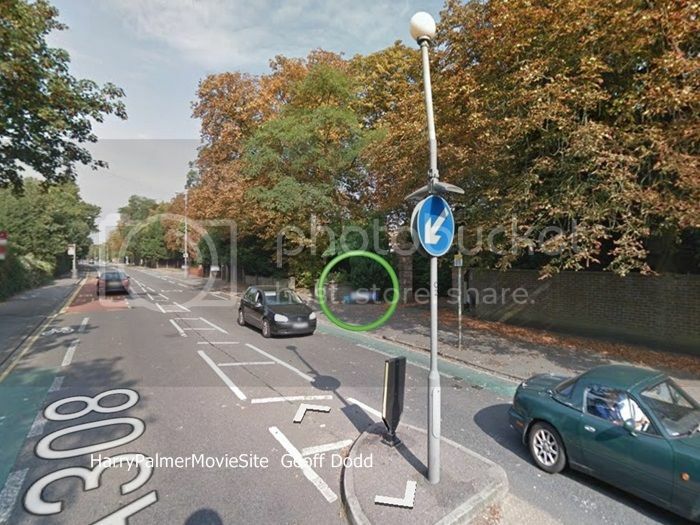 Update: on the spot where the car enters the building (as you can see on the picture below), you can see a big door. Behind the door is now a restaurant (the Victoria Restaurant)! 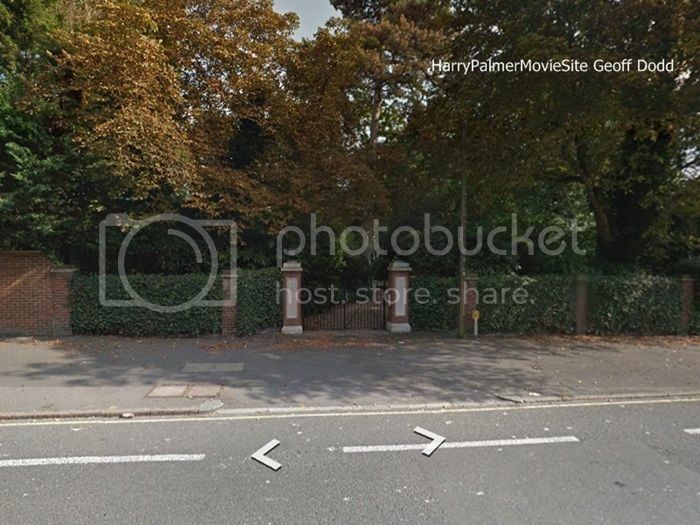 The court behind this behind this building is NOT the court where Harry is pushed out of the car and into the building. This location is yet unknown. Update: There is now a small hotel in the building, so in case you want a real Palmer night, check out this hotel: Hotel & Pension Belle Etage am Lietzensee. 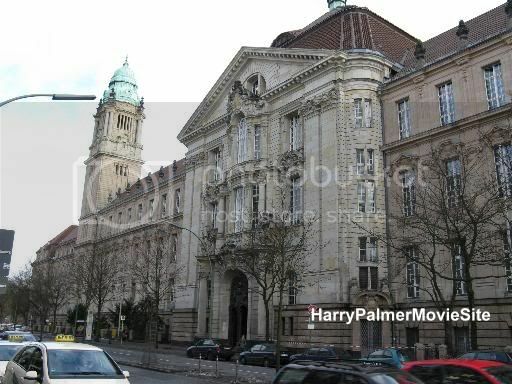 The beautiful police station where Harry Palmer meets inspector Reinhardt and asks him about Otto Ruckel and other crooks is situated in the Criminal Court of Berlin, the Amtsgericht Tiergarten, Turmstra�e 91 in Berlin. 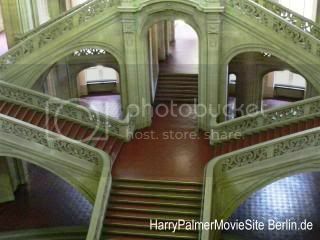 Unfortunately you can only enter the hall and have a look at the beautiful stairs but you are not allowed to make any pictures. 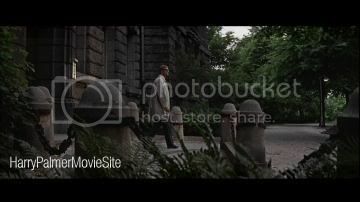 The exterior (top photos) is seen briefly when Harry visits the inspector for the second time, but this exterior shot is filmed somewhere else! 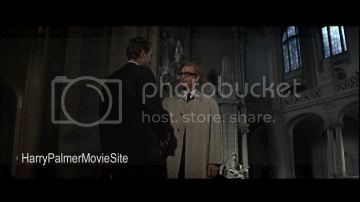 This is filmed at a real police station, the Polizeidirektion 2 - Abschnitt 24, located at Kaiserdamm 1, Berlin. (U-Bahn Sophie-Charlotte-Platz). These locations have been found by Peter Hegenbarth from Germany, many thanks for all your research. 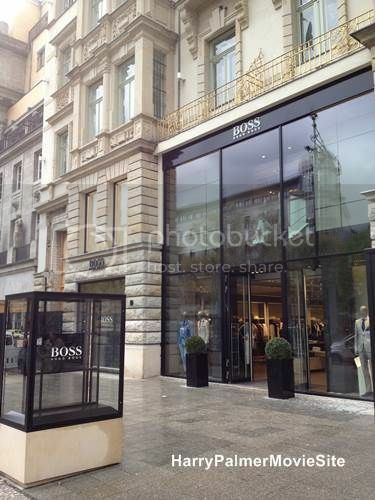 Unfortunately the building was completely renovated in 2014 and the frontlobby has dissappeared in and is made into a shop (Boss). So the original lift (right) and reception have gone I'm afraid... Also the gold-coloured overhang before the entrance on the street has gone. The hotel will a new entrance on the right side and will reopen November 2014. Same counts for the original rooms which still had a lot of original details and art-deco furniture. See 2014 pictures. 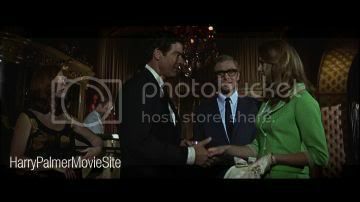 The Chez Nous nightclub which is used in Funeral in Berlin (Harry meets the "man with the green carnation"), can be found at the Marburger Stra�e 14 in Berlin. The club has been running until 2008 and there were two shows every day. 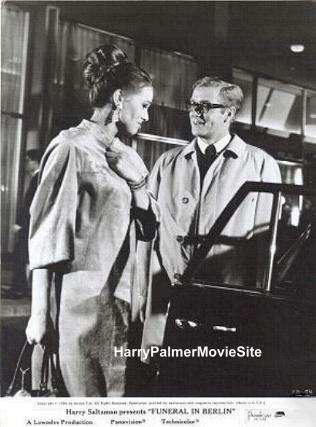 When Harry Palmer leaves the Chez Nous after "the man with the green carnation", he dissappears in an alley next to the Chez Nous. The alley was still there until 2001 when the building next to the Chez Nous was renovated. This alley is now closed of and used as entrance to parkingspots. This block next to the Chez Nous has been renovated and can be seen on the 2009 and 2010 photo. When it was closed in 2008 the interior was still the same as it was in 1966. Above this text on the left photo you can see the bar as it was in 2001. In a room next to the main entrance you can find another bar where "the man with the green carnation" was seated (barstool photo on the right). 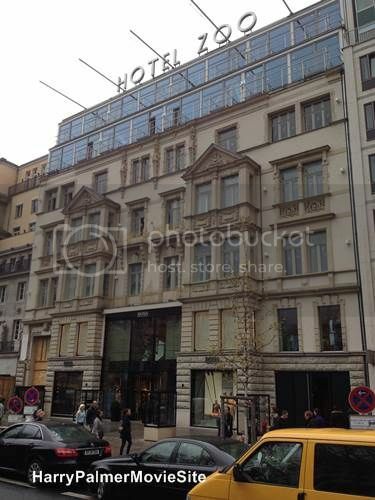 Harry was given the "telefon" in that room. 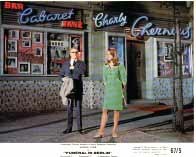 Again: incredible, nothing except the stage in Chez Nous had changed since the sixties... Cabaret Chez Nous (site offline at the moment) It is said that the owner is looking for another location. In 2010 the club has unfortunately been renovated completely and divided and transformed into two shops. 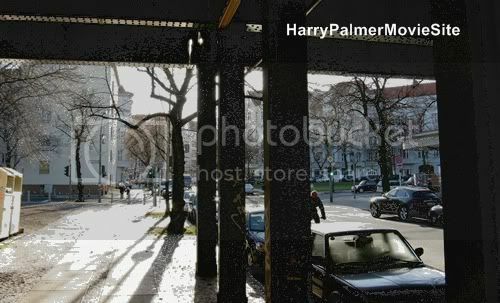 Harry meets with Kreutzman to discuss all arrangements in the Europa Center in the centre of Berlin. It is still there. 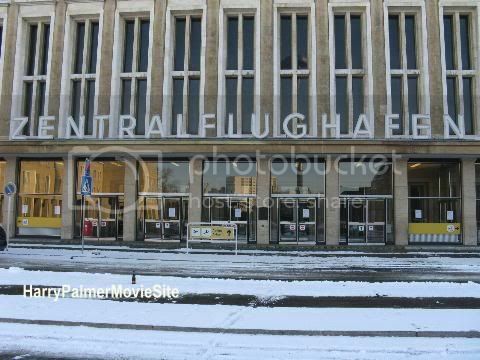 First (after the shot of the icerink) they meet on the outside of the now closed of first floor (changed into shops) of the shoppingcentre, next to the Tauentzien Stra�e. The floor they are on is now closed and turned into a coffeeshop with big 'Esprit' sticker on it. 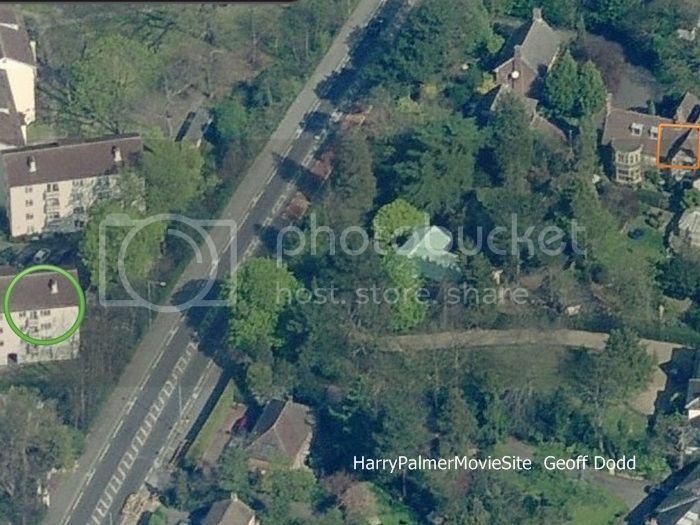 You can see a part of that location on the photo on the right. 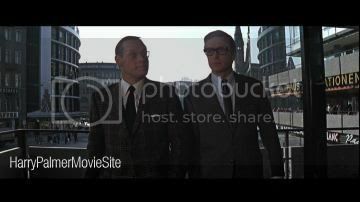 Their second meeting is on the roof of the officebuilding (the building with the big Mercedes sign on top), which is now office of the Commerzbank. Unfortunately the rooftop of that building is closed nowadays, but you can reach the first mentioned location I mentioned quite easily. 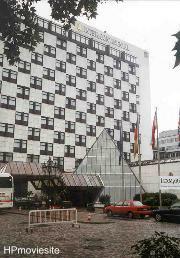 The Europa Center can be found on the Tauentzien Stra�e, next to the famous Kaiser Wilhelm Gedachtnis Kirche. 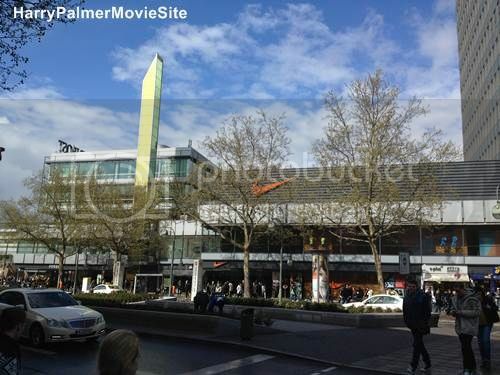 Update: 2014 situation added now a Nike shop. 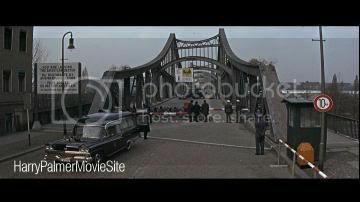 The bridge where the coffin crosses the border between East and West Berlin in Funeral in Berlin is the 'Swinem�nder Br�cke' in Berlin. 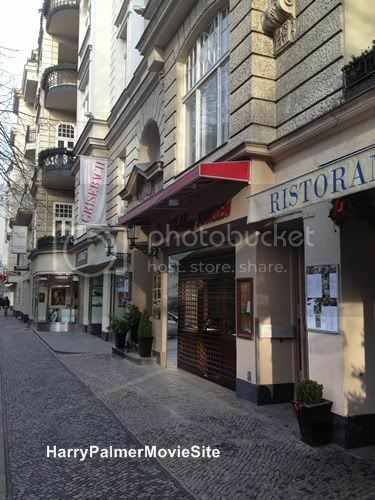 The 'Swinem�nder Br�cke' is located in Berlin-Wedding. It can be found easily from the S-trainstation 'Gesundbrunnen'. 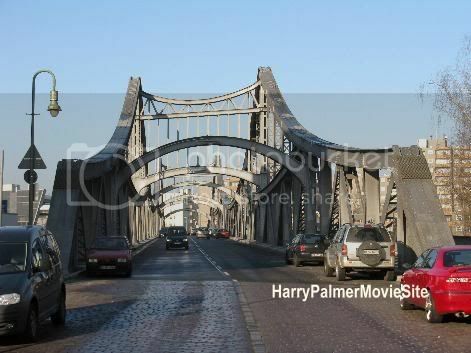 The bridge makes a 230m long connection between the Swinem�nder Strasse and the Bellermannstrasse. It was constructed in 1905 and because its incredible high costs many Berliners know the bridge as the "Millionenbr�cke". In the fifties the Swinem�nder Br�cke was refurbished (and this century again) . The bridge is protected under a monumentlaw so it won't dissappear in the near future. It was hard to find the bridge because you expect it to be over water... Many thanks to Lars F�rster, Germany. 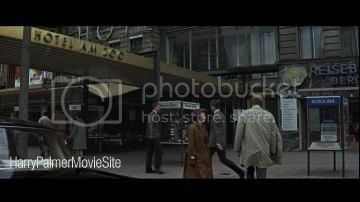 The location where the hired old lady leaves the car and gets her money for 'acting' at the exchange on the bridge is located at the Holtzendorffstra�e in Berlin. 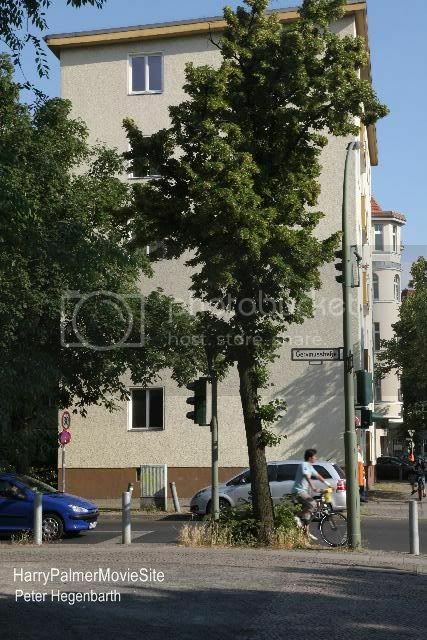 Again it was Peter Hegenbarth who found this Berlin location: "The Street on which the hearse drives is the Holtzendorffstra�e. 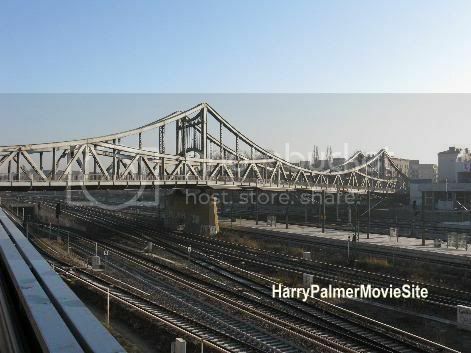 The camera looks under the bridge to the south to Holtzendorffplatz and Joachim-Friedrich-Stra�e. 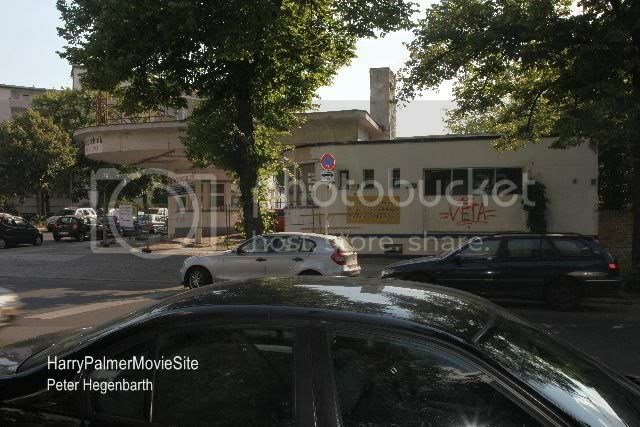 In front of the petrol-station is the Heilbronnerstra�e, in front of the new building is the Gerviniusstra�e. First: a typical S-Bahn or U-Bahn „overground“-bridge. Must be West-Berlin, due to political restrictions in early 1966. No leaves on the trees, no leaves on the ground. So it must be late march to late april.In the last shot in the background behind the widow we see a „Neubau“ (building build after the war). 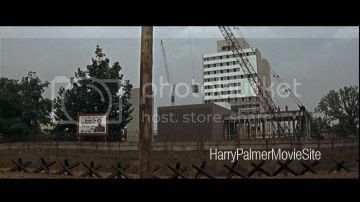 In the first shot we see a petrol-station in the background, to the right-hand side. The petrol-station? These things happened to get broken down in the past. But the new building still had to be present. 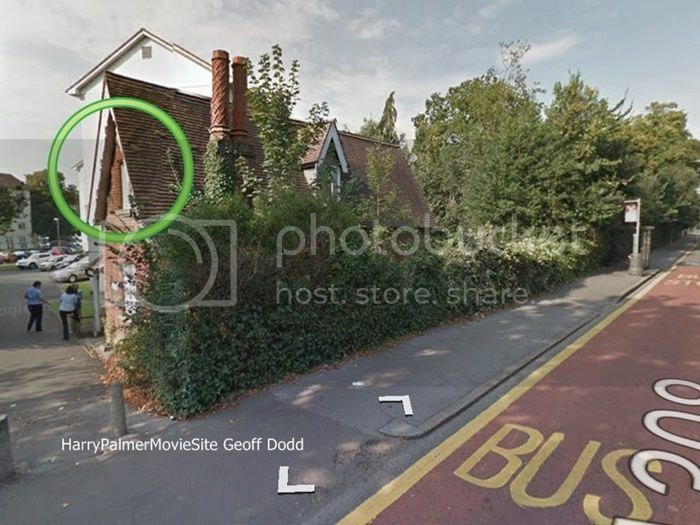 Again – where is an old petrol-station opposite such a new house? And it must be more inner-city, as the more rural areas below S- and U-Bahn-bridges do look different." Thanks again to Peter Hegenbarth. The bridge has been renovated but the fundaments and big poles are still the same as in the Sixties!